Who’s taking over? The flowers or the mass of people? 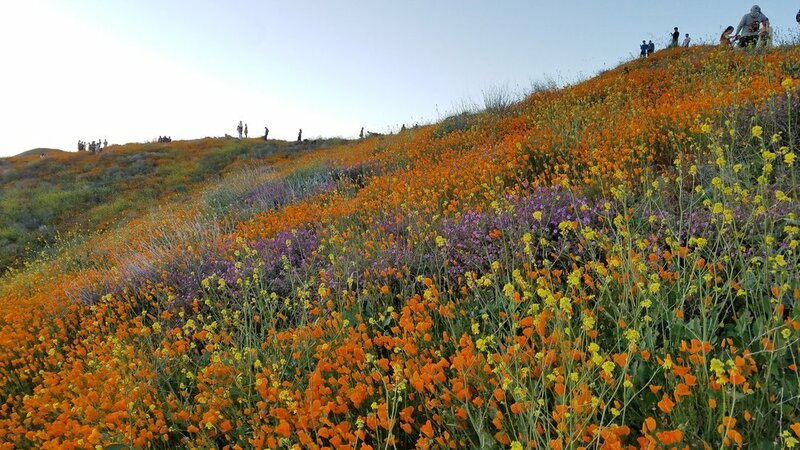 The Super Bloom was an amazing sight of nature and the painted lady butterflies (that can fly as fast as 25 miles per hour!) and other insects were flying around in this rare wonder. Unfortunately, I couldn’t help think about the recent news of the decline of our insect population. Yet another living group to add to our list of things we are destroying. Although extremely beautiful, these images don’t show the trampled and crushed flowers that were a consequence of people forming their own pathways to get great photos. I admit, I was one of these people clamoring up a steep hill on a precarious pathway that upon reflection, I realized was not a real path. It just seemed that way because people were forming it unnaturally. Maybe a big deal, maybe not? I don’t know for sure but it’s not a nice thing if I’m being honest. It’s just what humans do in our excitement to see it all and make sure we get a great Instagram shot.